Here is beautiful music - straightforward, deeply felt, expertly made yet far removed from deliberate cleverness, serene, affirmative, even holy. Harrison and Hovhaness complement one another with rare energy, and one suspects that this album will find new admirers for both men. The long oboe melody spinning out over the descending line of the Koussevitsky-inspired double basses and the modal intervals of the horns weave all the elements of the symphony together into a tapestry that I will go out on a limb and declare is the most beautiful movement of American symphonic music yet written. This post started out as a review of the impact of the three big 2013 composer anniversaries as measured by Google Trends. But the graph below of Google internet searches for Richard Wagner, Giuseppe Verdi and Benjamin Britten below simply confirms what has been obvious for a long time, namely that the anniversaries create a substantial short-term blip but no real lasting impact. So I will not bore everyone by pointing out yet again that composer anniversaries achieve very little. Instead I will build on my recent hypothesis that classical music's big opportunity is its current audience, a hypothesis, incidentally, that received widespread support. So now I am suggesting that just as the existing audience is one big opportunity, so neglected music from composers such as Alan Hovhaness and Lou Harrison - to name just two - is another big opportunity. Classical music is making three fundamental mistakes: one is thinking that dumbing-down makes great art more appealing, another is thinking that there is a big new untapped market among young people, and the final mistake is believing that giving prominent composers even more prominence somehow expands the market - did someone mention Richard Strauss? Google Trends shows that classical music is banging at the wrong door with composer anniversaries. So why not give the most beautiful American symphonic movement and a lot of other very good neglected music a chance instead? Also on Facebook and Twitter. No freebies used in this post. Any copyrighted material is included as "fair use", for the purpose of study, review or critical analysis only, and will be removed at the request of copyright owner(s). Excellent point. I featured Hovhaness on my blog a while back. http://www.classicalmusicforyou.com/.../18-hovhaness... I hope you don't mind me "whoring" my blog here. Delete at will, if you feel violated. 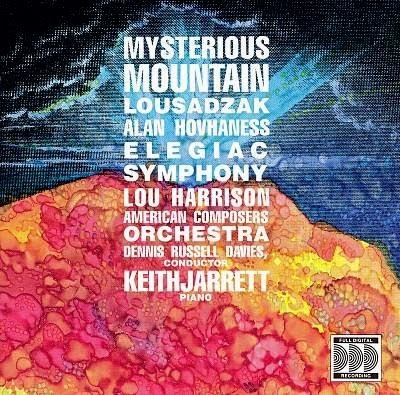 I've been listening to classical music for nigh on 50 years and while I have heard of (and enjoyed) Hovhaness I've never come across Lou Harrison. Which would go to reinforce your argument that the real market for such composers - shamefully neglected by our prime broadcaster of classical music - is not the "young" nebulous audience relentlessly sought after with regurgitated lollipops but people such as myself. I found Harrison's "7 Pastorales" back in the 90s while hunting down Peggy Glanville-Hicks' Etruscan Concerto, also on a DRD/Jarrett disk. As you mention the American symphonic repertoire, it's worth considering how much fine 20th century music from other nations has yet to be given wide exposure internationally. Right now I'm listening to a newish performance of Australian Ross Edwards' Violin Concerto "Maninyas", which is extremely accessible, even danceable! I've had the original recording (soloist: Dene Olding) since 1988 and it's still a favourite.